Wonderful third floor St.Simons Island residence. Professionally furnished. Two large bedrooms. Two full baths with separate walk in showers. Jacuzzi tub in master bath. Balcony with ocean view. The community features covered parking, elevator, swimming pool and hot tub. Located near the Village Shops & Restaurants. Across the street from public beach. 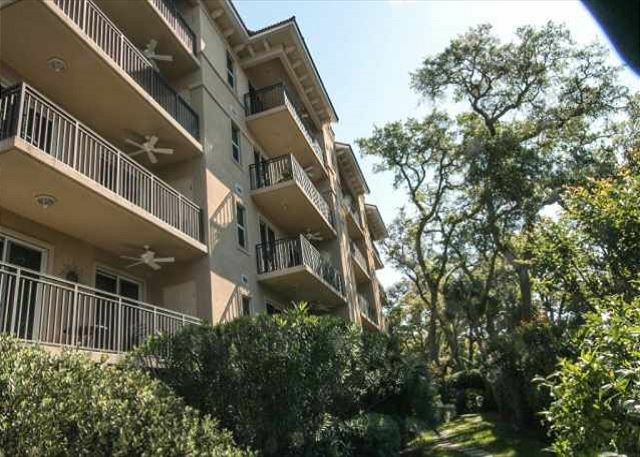 Real Escapes Properties is proud to offer this two bedroom, two baths third floor St. Simons Island residence. It is comfortably furnished, generously sized, and lavishly appointed. Features include granite counter tops in the kitchen and baths, and a balcony that is accessible from both the living room and master suite, with a great ocean view. The master has a king sized bed and en suite with a Jacuzzi tub and an over sized walk in shower along with his and hers sinks. There is also a ceiling fan and TV in the master and sliding glass doors out to the balcony. The guest bedroom features 2 double beds, a ceiling fan and a flat screen TV. There is also an attached bathroom with a walk in shower that can also be accessed from the hallway. The community features one assigned covered parking space and room for overflow outside the building. There is an elevator, a swimming pool and hot tub. 760 Ocean Boulevard is located near the Village Shops & Restaurants, and is directly across the street from a public beach. Spacious accommodations. Breathtaking view. Modern conveniences. Sofa in living room could’ve been more comfortable. great location and a fantastic condo. could use a small safe in the unit . The location and view was perfect, however the AC was not working properly. The management company sent someone out the next morning and he thought the issue was a very dirty filter. The problem was not resolved. When I called the AC repairman back he indicated 73-75 degrees should be comfortable enough and didnt want to come back out as he was 30 minutes away. The bathrooms were not cleaned well. Mold and soap scum was visible. The coffee pot was full of grounds in the water tank. Cleaning supplies were left out on the dresser. I have sent pictures of the dirty coffee pot and emailed my concerns to the management company but I have not heard from them. I have rented from Real Escapes several times and have always been pleased. This time was just a bit disappointing. Very nice condo this is my second time staying here and love it. Very convenient. This was our fifth year renting this unit for January and February, our getaway from the cold winters of Wisconsin. St. Simons Island itself is a great location - charming, quiet and full of warm friendly people. The condo is spacious, clean, well furnished and offers a nice view of the ocean (the beach is a two-minute walk.) Best of all, the folks at RealEscapes (the property managers) are always available, courteous and responsive to every request. We enthusiastically recommend this property. You can't go wrong renting this condo! Bill from Stockholm,WI. Great place to stay as always. Great customer service. Can't wait to come back again! This was our 3rd time there but it has not been kept up. Missing utensils &!latware, no area rug in LRm and cheap runner in front of sink. Porch furniture cushions have deteriorated beyong use. The master bedroom bedcover is very tired. One of the cushions on the sofa was split. If it were not for the view og a narrow piece of ocean from the balcony, it would have limited value for the cost. This was our family's 8th visit to St. Simon's Island. As usual we had a great vacation. St. Simon's is great place. Easy to get around, great restaurants, and many things to do or simply relax. We stayed at this condo probably about four or five times. Real Escapes management is very professional and are great to work with. They have always gone out of their way to help us out. I hate to complain but there are some minor things that could be done to the condo. Examples are make sure all the lights are working, repair the little things that are broken (eg. the vanity in the spare bath) maybe have a few extra towels on hand. I think the little things add up. On our first day a lady from the management team stopped by to make sure the TVs were working and spent at least an hour to get them set up. Great service. The housekeeping staff stopped by to check that all was okay. Great service. Real Escapes is top notch and we will continue going through them on our future trips to St. Simon's. We had a wonderful experience; Brooke was great and helped us find a pet-friendly condo rental for a last-minute family trip. She also gave us the name of a sitter so we could have an anniversary dinner while we were there. I have already recommended Real Escapes to a friend and will definitely use them again in the future!! We are here for two months (Jan and Feb), not one and not yet at the end of our stay, but we keep coming back (4th year in this unit) because it works so well for us. The front door needs painting and the handle lock is hard to open (would be good to replace), but otherwise the unit is in good shape and the location is ideal. Great stay as usual. No surprises. Can't wait to come back. Watched the hurricane from porch! Power only blipped a few times. Labor Dayib SSI is becoming an antipated joy! Could not have gone better. Great customer service. We arrived after hours, but our check in pkg was waiting on us and we were able to go right to the condo and get settled in. Check out was quick and easy as usual. We lucked out on the weather and had more walks on beach than we ever dreamed in late Dec/early Jan. Already knew the unit and it was great again. Loved it and hope to return more times in the future. You need to know that the nearby beaches are only available at low tide (Massengale & East beaches are nearby, and always available). I prefer the nearby beaches, at low tide because the tidal pools and sandbars are fun for kids & dogs. The tidal pools are too shallow for sharks, and calm enough to avoid jelly fish. Check the tide charts each day to choose your beach. 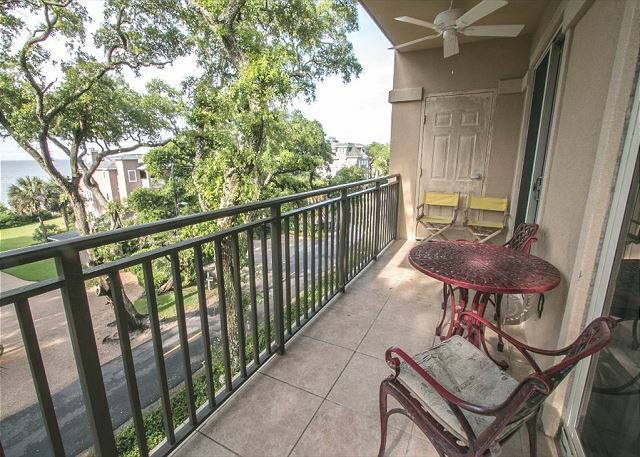 We love this condo, it is very functional and in a great location. Our condo was exactly as the internet portrayed it, which is highly unusual. It was clean and the location was sooo convenient. The condo is huge. The washing machine had a problem, and within less than 24 hours, it was replaced, no questions asked. Cameron, part of the management staff, was totally on top of things. She was wonderful and kept calling us letting us know the status of things. We would not stay anywhere else when we return to ST. Simmons. It was our first time there and a very very positive one. Cant tell you enough how good the location and condo were. Thanks so much. Nice and quiet place to stay. Only had one issue and it was resolved quickly. Can't want to stay at 760 OB, room #304 again. We have stayed in this condo several times before and as always had a great experience. Years, this is the only place I've ever stayed that I was NOT longing for the comforts of home by day three! It is beautiful, clean , spacious and location is convenient to restaurants and beach. Plan on going back this summer! Just had our 2nd stay at this condo. More beautiful than before with all new bed linens and new furniture in the den area. Couch has a hidden sofa bed, so our teenage son enjoyed having his own space away from his sisters (although the 2nd bedroom is very spacious and has 2 nice queen size beds). We love this condo! Great for adults and kids. Very spacious and has a nice-size laundry room for keeping up with a family's needs. Beautiful ocean views from the porch, on a quiet street, and easy access to a nice beach at low tide. See you next time, Condo #304! Our stay was excellent. We have stayed at 760 Ocean Blvd Unit 304 a few times in the past. This place is great. Everything is convenient. We'll be back. Real Escapes Properties are very helpful and have always taken excellent care of us. Immediately after arriving we were met by an angry neighbor upset because I parked on the line of my assigned parking space. I moved my car 2 inches. The pool was ice cold; the hot tub never hot. For $250 a night we expected better. The whole experience was disappointing. We cut our vacation short one full day& night. We had a wonderful time! The condo is right across the street from the beach, and just a short walk from the village. And the view of the ocean is amazing! The condo itself is very nice. Even though it is only 2 bedrooms, it is very roomy--with large bathrooms, a large laundry room, and large closets to stow your stuff. The open floor plan for the kitchen, dining, and den is also nice. And, we were allowed to bring our sweet Roxie (dog). WON'T RECOMMEND BECAUSE OF THE FOLLOWING: shabby or uncomfortable upholstered furniture, chipped dining room furniture, Non-working front door hardware, several carpet stains in Master bedroom & L.R., soiled/uncomfortable porch furniture, noisy master bedroom boxsprings and poor shower head in guest BR. VERY GOOD ASPECTS: Location, spacious interior, upscale architecture, excellent TV and sound system, scenic ocean view, very good non-upholstered furnishings and appliances, underground parking, elevator, luggage dolly, exceptional grounds, washer/dryer. This property is one of the best we've ever rented. The pictures don't do it justice. The condo is huge and the two bedrooms are well separated each with their own bathroom, so everyone gets privacy. The view of the ocean is beautiful and it's an easy walk to The Village, the pier, lighthouse and playgrounds. The kitchen is amazing and the master bathroom is unbelievably big. There's a washer/dryer, cable and wifi. The only drawbacks were that the living room and patio furniture need updating, and it is difficult to get a phone signal in the unit. But, then again, some phone carriers aren't great on the island. If you're considering renting this unit, we highly recommend it. This condo was very comfortable and clean. and roomy! the location was convenient. checkin and parking were a breeze. the view was lovely. the only things I would do differently next time are stay longer and go for more bike rides. We arrived late at night, all check in materials and specific directions were ready for us. Condo was lovely! great location, cute little pool, perfect for walks in to town or dip in the ocean... Well maintained place, spent lots of time on the balcony watching the water! My 81 year old mother who doesn't get to walk far really enjoyed evenings on the couch looking out the patio door watching the boats and ships sail by. Sitting on the fishing pier in the shade watching people catch fish and crabs was a thrill for her too. Taking a dolphin watching tour was a way to get her on the water. The younger ones in my group (75, 73 and 71, myself 50) enjoyed touring the lighthouse and maritime museums and walking the shopping district. Also took a day to enjoy Jekyll Island--the trolley tour through the historic district was awesome. Have stayed at the condo several times. It is a great location and a wonderful condo. The staff at Real Escapes have always been very professional and helpful. First time in St. Simons,can't wait to go back. We have stayed in this condo 4 or 5 times now and it is always well maintained and comfortable.Real Escapes is very easy to work with and always professional.